Muslim Arab rioters attack police forces after the Rambam Gate was opened to visitors; Mount closed to Jewish visitors. Police arrested three Arab rioters Tuesday morning on suspicion of throwing rocks and firecrackers at police on the Temple Mount in Jerusalem, right after police opened the Rambam Gate entrance to the Mount. Two police officers were wounded and are being taken to Sha'arei Tzedek Hospital. According to Kikar HaShabbat, dozens of Muslims began throwing rocks and fireworks at police once the gate, which is the only entrance through which Jews may enter the Mount, was opened. A police force dispersed the rioters through the use of stun grenades. Police have closed the Mount to Jewish visitors as a result of the riots, which have a direct connection to talks over religious freedom at the Mount due to commence Tuesday. 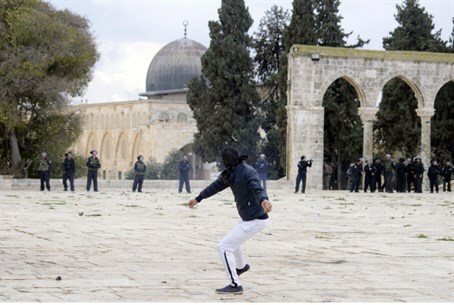 Israeli police Tuesday entered the Temple Mount area to disperse stone-throwing Arab rioters, a police spokesman said. Police used stun grenades to disperse the rioters, Micky Rosenfeld told AFP, explaining that there was "high tension" ahead of discussions expected in the Knesset later Tuesday regarding the Temple Mount. Palestinian medics said 15 protesters were injured by rubber bullets. "Police remain deployed at the Temple Mount and visits by tourists are continuing," Rosenfeld said.The Temple Mount, which is Judaism's holiest site, has seen numerous clashes between Jewish and Muslim worshippers over the past several months. Muslim anger over the site has escalated since MKs announced efforts to equalize prayer rights at the site, through legislation which would allow full religious freedom. The Mount has also been frequently closed to Jewish visitors and is often the site of anti-Jewish discrimination. Jews are prevented from praying or performing any other religious ritual, while Muslim visitors pray freely. Rabbi Chaim Richman, International Director of the Temple Institute, points out that today’s riots on the Temple Mount are in direct response to the historic discussion regarding Israeli sovereignty on the Temple Mount which is scheduled to take place in the Knesset Tuesday. This is the first Knesset hearing regarding the status of the Temple Mount since its liberation in the 1967 Six-Day War. “Clearly, there are nefarious forces at work that are attempting to frighten Israel into submission," Rabbi Richman said Tuesday. "Ironically, on the very day upon which the Israeli Knesset will be considering this very issue, we see before us today a stark reality check, and a lesson on who is really sovereign on the Temple Mount."